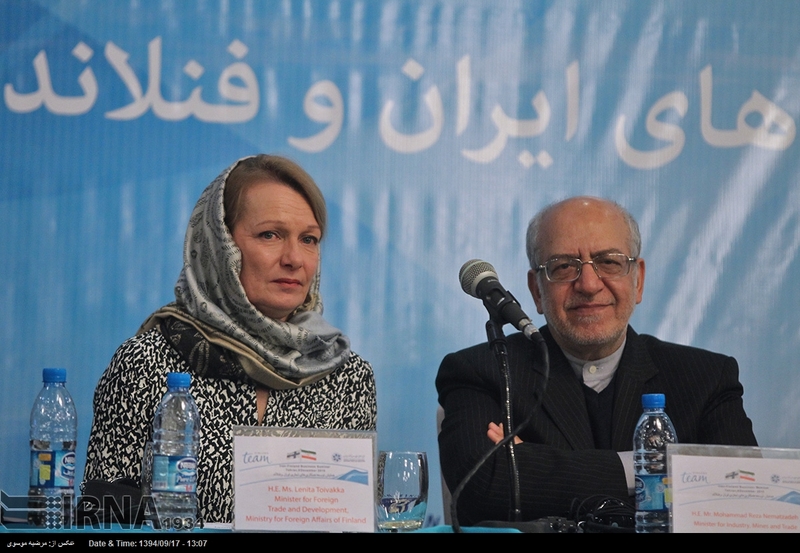 On December 8 and 9, 2015, Ms. Lenita Toivakka, Finland’s Minister for Foreign Trade and Development, arrived in Tehran heading a major economic delegation comprising 70 representatives of Finnish companies active in such fields as bioeconomy, information technology, clean technologies, construction and urban development. As put by the Finnish minister, the trip was aimed at paving the way for more cooperation between companies from Iran and Finland in various fields of trade and investment, while providing Finland’s economic activists with an opportunity to become familiar with Iran's economic conditions and regulations and also know their future trade partners in this country. This was one of the biggest economic delegations to have been ever sent by Finland to a foreign country. Therefore, such issues as the huge inflow of asylum seekers into Europe as well as the recent terrorist attacks in Paris, both of which have entangled European countries during recent weeks and months, constituted the beginning of Hamshahri Daily interview with the Finnish minister. The outlook of bilateral relations between Tehran and Helsinki, the viewpoint of the Finns on Iran’s market as well as the issue of the presence of the Iranian women in the society and the business environment were other issues that were discussed with Ms. Toivakka. Q: Syrian war refugees and asylum seekers that have reached Europe during recent months are mostly headed for Germany and other wealthy countries in Northern and Western Europe; Finland is one of these countries. The presence of asylum seekers in Europe has now turned into a major crisis. How these conditions have affected on your country? A: This is a good question. Let’s under the present circumstances describe these people as asylum seekers and not refugees. There are specific conditions under which a person can be known as a refugee and it follow international regulations and its own definitions. The number of asylum seekers that are present in Finland has exceeded 35,000 during the current year. The presence of this number of asylum seekers, of course in terms of per capita population in European countries, has caused Finland to rank the fourth among European Union members that are accepting asylum seekers. This comes while the number of asylum seekers in our country was about 3,000 up to a year ago. Therefore, we have been witnessing a sudden rise in the number of asylum seekers in Finland. This issue, like other European countries, is considered a major challenge for our country as well. Our government is faced with new conditions because we must now think about refuge for these people. When their asylum process is completed, they would need houses as well as suitable education and vocational conditions. Many sessions have been held within the Finnish government and we are seeking a solution to get out of these critical conditions because we want to provide these people, who are running away from war and conflict, with suitable living conditions. At the same time, I must mention that not all these people who have entered Finland will be given residence permits and not all of them will be recognized as refugees. Q: What is the final policy of Finland’s government vis-à-vis asylum seekers? Is your government opposed to presence of asylum seekers in Europe and Finland or accepts them? A: We have taken part in the European Union’s quota program for accepting asylum seekers and have already taken in our quota. In fact, we have accepted our share of the responsibility that European countries and the European Union shoulder in the face of asylum seekers. The approach adopted by our government to this issue has been a constructive and pragmatic approach since the very beginning. We are not opposed to entry of asylum seekers, but along with other members of the European Union, we are trying to find a solution for this crisis. Q: We witnessed terror attacks in the French capital, Paris, quite recently, which left 130 people dead and more than 350 wounded. Have these attacks had any social and economic effects on your country and on other European countries in general? A: Of course, these attacks have had extensive social effects on European countries. I believe that social and psychological effects of this incident have far outweighed its economic impact; especially the feeling of security among people living in the European Union countries has been heavily affected by these attacks. Of course, these attacks have had economic effects as well, especially in countries like France and Belgium where entry of foreign tourists has fallen as a result of the terror attacks. In Finland, however, we have not suffered major economic impacts after the attacks. Q: The attacks in Paris were carried out by terrorist forces affiliated with Daesh terrorist group and some of those forces are said to have entered Europe among asylum seekers from Syria. This issue has led to sharp positions against the entry of asylum seekers to Europe. The measures taken by Daesh in Paris, and later on in the US state of California, have provided some political personalities and figures in these countries with a good excuse to promote their Islamophobic agenda. Do you see such conditions in Finland as well? A: The recent anti-Islam atmosphere, which directly arises from these incidents, has given rise to many debates and discussions in Finland as well, both among ordinary people and among media and even within the government, but an anti-Islam atmosphere has not taken shape in our country at all. Discussions in Finland have been mostly focused on how our government should cooperate with other countries in the world in order to fight against terrorism and violence. Q: Ms. Toivakka, let’s talk about bilateral relations between Iran and Finland. As you know, the issue of security is one of the most important factors for investment in any region of the world. Under the present circumstances, Iran is the sole secure country in the Middle East. What effect this issue can have on trade ties between Finland and Iran and also on possible investment in Iran by your government? A: We have always had good relations with Iran. Iran is an important actor in the Middle East. Your country is a great county. It has a population of about 80 million and is among important regional countries from political and economic viewpoints. Your history also tells us that you have always played an axial role in this region and have always been one of our main partners in the region. In coming years and in view of new conditions, we are sure that relations between our country and Iran will certainly expand. If you look at Finland’s history, you will see that our country is a country, which has always tried to have good relations with all other countries of the world. Finland is a small country with a population of only 5 million, but we have always been in contact with all countries in the world and cooperated with them. Many of world people admit that the Finnish people have always treated other culture in a friendly and constructive way. Q: As you said, Iran is a country with a population of about 80 million. What is your opinion about Iran? Do you simply see Iran as another big market for the export of your products, or relations between Finland and Iran are expected to be based on a win-win equation? Are you planning to transfer technical know-how and technology to Iran in addition to possible export of your products to the Iranian market? A: The Iranian market is a good market for the export of our products. In addition to products, we can also export services to Iran, especially in the field of urban and information technology infrastructure. However, we do not see Iran simply as a big consumer market. Our companies are looking forward to investing in Iran. Some of them have offices in Iran as we speak. The high number and composition of people who make up my accompanying delegation shows that we are serious about boosting our economic relations with Iran. Iran and Finland have good political and diplomatic relations with each other. We are going to further develop bilateral economic relations. Our visit is aimed at getting better understanding of the economic conditions in both countries. In this stage, we must gain more information about each country’s economic conditions. We must know each other better and trade companies in the two countries must get to know each other’s activities better. We must also get a better understanding of laws governing economic atmosphere of each country in order to be able to remove any possible obstacles in this regard. Our relations with Iran will not be restricted to selling products and will certainly include transfer of technology and technical know-how as well. Q: You are active in the field of women’s rights and job creation for women in Finland. Do you have any information on the activities of women in the Iranian society? To what extent do you know the community of the Iranian women? A: To tell you the truth I do not know the Iranian women’s community properly, but in this trip, I had the chance to have a meeting with a number of female entrepreneurs in Iran. I know that about 60 percent of university students in Iran are girls and this is very good. In Finland, as well, most of students in universities are girls. I believe that both here and in Finland, more women should enter the field of trade. This issue is not simply a challenging issue for your country, because it is also a major challenge in Finland. [A major issue is] how to strike a balance between family and the workplace and how women can get involved more in various trade and executive fields. In my opinion, every society needs an equal proportion of healthy and capable women and men. Q: Apart from political and economic matters, what is your opinion about the Iranian people and the interaction that can take shape between the two countries under new conditions that will come about following the removal of sanctions, which have been imposed on Iran? A: The people in Iran possess a rich culture. In my opinion face-to-face contacts between our people and the people of Iran must increase, so that, they would know each other’s cultures better. In today’s world we need to treat each other with more respect and, in my opinion, the best way to achieve this goal, is to obtain a better understanding of each other. I invite the Iranian people to travel to our country and become familiar with our people. Apart from that, as representative of Finland’s government and also as representative of the European Union, I sincerely invite the Iranian people as well as the Iranian businesspeople to enter the global market and the European market, because there are good opportunities in various fields in Europe, and we can work together in these common fields. This interview excerpt was originally published at IranReview.org.